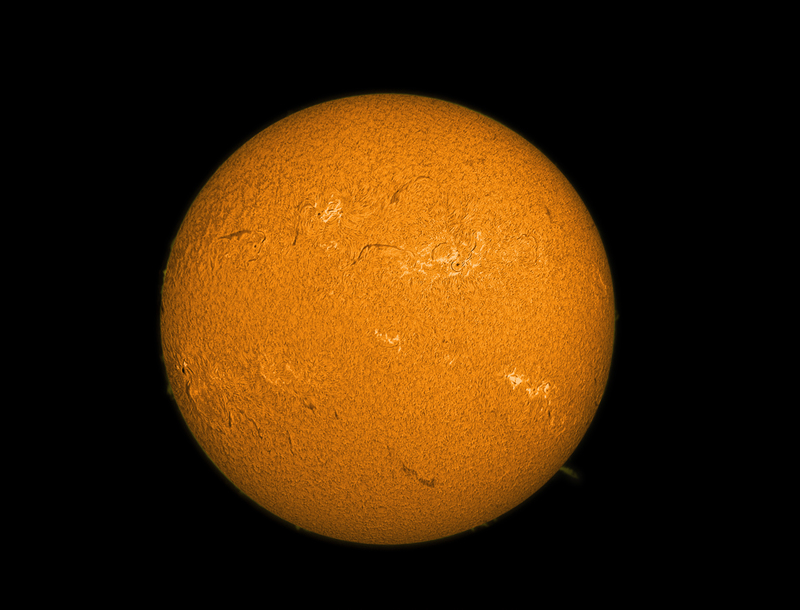 This is my first image with the Lunt80 80mm H-a solar telescope with the DSII double stack module attached. The DSII makes a big difference in surface detail. The Lunt80 is attached to a Losmandy TimeLapse motor that is operated at the sidereal rate. The TimeLapse is attached to the sturdy Manfrotto 400 gear head mount set for our 38 deg lattitude. The 400 is secured on a heavy-duty Feisol CT3372LV carbon fiber tripod. Frame selection and alignment and wavelets processing was done in Registax. Final processing including masks and layers to bring out the prominances was done in Photoshop CS6. The solar disk slightly overfilled the DMK51 sensor. A home-made 0.8X reducer was made using an f/-250 plano-convex lens from Edmunds. It was epoxied into an Astrodon 1.25" filter cell holder, which was then simply attached to the 1.25" nose piece of the DMK51 camera. The image above has not been cropped.